I’ve wanted to re-read this ever since I first heard the film that’s coming out, featuring Daniel Radcliffe as Arthur Kipps. I’ll post a link to the trailer at the bottom, but it looks amazing. I’m not sure Mr Radcliffe will ever be anything but Harry Potter, but I guess we’ll find out in early 2012. In the meantime, Hannah from Once Upon A Time was nice enough to send me a copy of the book after we had a lengthy discussion of the suitability of Mr Radcliffe. Proud and solitary, Eel Marsh House surveys the windswept reaches of the salt marshes beyond Nine Lives Causeway. Arthur Kipps, a junior solicitor, is summonded to attend the funeral of Mrs Alice Drablow, the house’s sole inhabitant, unaware of the tragic secrets which lie hidden behind the shuttered windows. 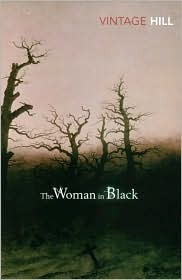 It is not until he glimpses a wasted young woman, dressed all in black, at the funeral, that a creeping sense of unease begins to take hold, a feeling deepened by the reluctance of the locals to talk of the woman in black – and her terrible purpose. I really, really enjoyed this. I’ve got a thing for creepy, old-fashioned ghost stories – they’re just so much more intense than more modern ones. Ms Hill is particularly skilled at creating atmosphere and describing the terror and anxiety Mr Kipp is feeling. I think that’s what makes The Woman in Black so great – you can really feel how frightened Arthur is, and so it forces you to feel the same way. I suppose it’s fairly conventional in a way – residents of the local village that refuse to speak of the House and a small dog that snarls and barks when there’s nothing there. But somehow, it’s better than that. The ghost herself isn’t your usual villain either. She’s not evil exactly, just slightly creepy and sinister, but that only adds to the mystery and suspense really. That said, I only ‘liked’ this book until the very end. After that, I loved it. I have read it before, but not in a number of years so I’d completely forgotten the ending. Without explaining further, just know it’s one of the best endings to a novel I’ve ever read. Looking at the trailer, they seem to have changed quite a few bits for the film- I don’t really understand the presence of the children and they seem to have added more action. But then, I suppose you can’t make a film out of Daniel Radcliffe just stood there looking scared a lot. It looks good though – I can’t wait! I am so excited to read this! I have been looking for a real good ghost story and this one looks great! Wow, sounds great, what a good review. You've got me intersted in this. Awesome! I got to admit I've never even heard of this book, which is a shame. I am looking forward to reading it before seeing the movie.